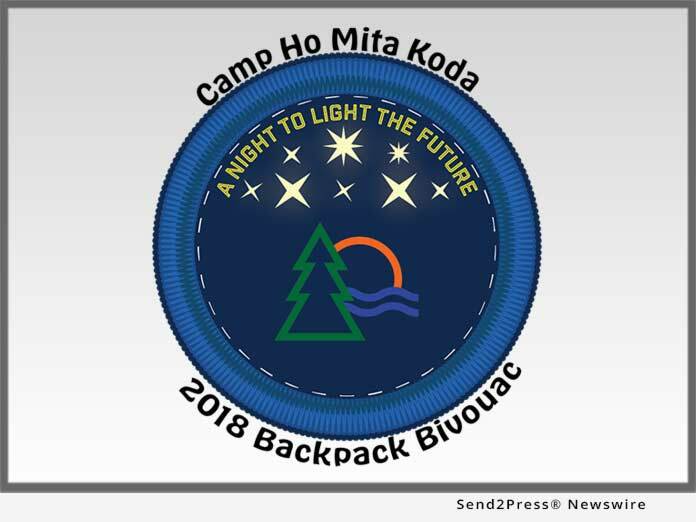 NEWBURY, Ohio, Aug 27, 2018 (SEND2PRESS NEWSWIRE) — The Camp Ho Mita Koda Foundation is proud to announce that its 2018 Backpack Bivouac fundraising event will take place at the Helmsley Pavilion at Camp Ho Mita Koda on Saturday, September 29, 2018, beginning at 6 p.m. This year’s theme, “A Night to Light the Future,” will raise critical dollars to help Camp Ho Mita Koda host children with diabetes as campers well into the future. As Camp’s largest fundraising annual event, Bivouac is critically important as we work to continue the mission and vision set forth in 1929 by Dr. Henry and Betty John at the nation’s first camp for children with juvenile diabetes. The Camp Ho Mita Koda Foundation was able to host over 150 children with diabetes for the 2018 camp season and we look forward to hosting even more campers in 2019. A “bivouac” is a French term for a temporary encampment, shelter or lodging. These shelters are frequently out under the stars, like Camp Ho Mita Koda, which is set on 72 beautiful acres in Geauga County. Campers sleep in cabins organized by age group, enjoying camp fires at night and traditional camp activities each day including swimming, horseback riding, rock climbing, and more. Campers receive around the clock medical care provided by our community’s leading hospitals systems including the Cleveland Clinic, MetroHealth, and University Hospitals. Camp Ho Mita Koda relies on contributions to operate. This summer, overnight camp was offered at $650 per week for each camper. This is a 50 percent discount to the roughly $1300 per week that it costs the Camp Ho Mita Koda Foundation to provide camp to each camper. Camperships are also available, as the cost of managing juvenile diabetes is very high and a struggle for many families. The Camp Ho Kita Koda Foundation’s goal is that any interested camper be able to participate, regardless of family income, with help from our campership program. This year’s event promises to be the best yet with a silent auction, great food, and a growing, robust camp community. Come join us as we celebrate our successes and look forward to the future! If you would like to sponsor this event, donate an auction item, or attend, please visit https://www.camphomitakoda.org/bivouac/. The Camp Ho Mita Koda Foundation is a registered 501(c)(3) that was formed in 2017 to save and operate Camp Ho Mita Koda in Newbury, Ohio. Each summer, over 150 campers come to our 72-acre camp to make friends, have fun, and learn how to manage their disease. For more information about Camp Ho Mita Koda, please visit https://www.camphomitakoda.org/.